To marzipan: in a small saucepan, warm the jam with 1 tablespoon cold water, and sieve. Place the cake on a board and brush with the warm jam. On a surface dusted with icing sugar, roll out the marzipan to a 33cm round. Lift the paste over the cake and ease to fit smoothly around the sides. Trim off any excess. Cover the cake with clingfilm to prevent the marzipan from drying out and store in a cool place for up to a week before icing and decorating. Making the decorations: on a surface dusted with icing sugar, roll out 150g of the Regalice icing and cut out shapes using tree cutters ranging in height from 4cm to 8cm. You will need about 20 trees in varying sizes. Transfer to a baking sheet lined with parchment. Using black icing, pipe simple decorations on the trees. Knead the icing trimmings and shape into snowballs of various sizes. Place on the baking sheet with the trees, and leave to set, uncovered, in a cool place for 1 to 2 days. Icing the cake: remove the clingfilm from the marzipanned cake and lightly brush with water. On a surface dusted with icing sugar, roll out the remaining Regalice icing to a 33cm round. Lift over the cake and smooth the icing down the sides. Trim off the excess icing around the cake’s base. Dust your palms with icing sugar, and gently 'polish' the surface of the icing with the heal of your hand, to smooth out any creases and uneven areas. Decorating: in a bowl, beat the egg white with enough icing sugar to make a paste that forms firm peaks. Reserve 2 tablespoons then spread the remainder in a circle over the centre of the cake to within about 7cm of the edges. Gently press the tree shapes upright into the soft icing, supporting them around the bases with the snowballs. Finishing touches: fix a metre of red ribbon around the cake by putting a little of the reserved icing on the ends. Use more of the icing to secure trees at irregular intervals around the base. Scatter more snowballs around the trees, also securing with icing. Once decorated, cover the cake loosely with clingfilm and store in a cool, dry place for up to two weeks before Christmas. 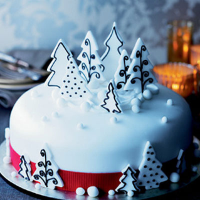 To make this cake, please click here for Christmas Cake with Drambuie-Soaked Vine Fruits.